Now the Old Maps Online website has been live and accessible to the public for just over two weeks and the initial flurry of publicity is over we have a little time to pause and reflect on how the launch has gone in comparison to previous publicity drives. After the good press coverage we generated for the launch and re-launch of A Vision of Britain through Time in both national and regional news outlets at first glance it may appear our press release this time was less successful. However, this relates only to traditional news outlets and we have had a respectable amount of online press coverage, indeed the site even appeared on Spanish TV. Something that is new to us, but has proved invaluable is the organic spread of knowledge about the site through social media. Twitter in particular has seen some very good comments and people around the world are still passing the site on this way. Initial audience figures are good, by the 13th of March we had received nearly 150,000 unique users since we launched. This averages out at roughly 8,000 users per day, although our busiest day last week saw more than 30,000 unique users and over 10% of visitors returned. In terms of our own publicity activites we have of course been promoting the site through various email distribution lists and online activities as we found this a useful tool in previous launches. We have also been attending events to speak about the project, giving demonstrations and distributing our flyers. We began with the special workshop “Working Digitally with Historical Maps“ organised as part of the Association of American Geographers conference. It was held on the 25th February in the impressive Stephen A. Schwarzman Building the flagship building of the New York Public Library. The keynote speech at that event announcing the website was jointly given by David Rumsey, Petr Pridal and Humphrey Southall. The following Wednesday (29th) saw the main UK launch in the grand art deco surroundings of Chancellor’s hall in Senate House, part of the University of London. The Gerald Alymer Seminar “Locating the Past“ attracted 100 participants and saw a range of speakers talking about historical place and space. The introduction to the day, including the announcement about the website launch, was given by Humphrey Southall whilst Paula gave demonstrations of the site in action throughout the day. Wednesday last week (7th) saw Humphrey Southall again presenting and Paula demonstrating the site. This time in the equally appealing Weston room with its nineteenth century floor mosaic and stained glass windows in the Maughan Library at Kings College, London. 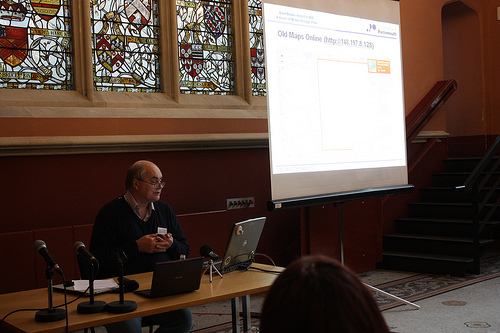 The event organised by the JISC-funded GECO project, “Geospatial” in the Cultural Heritage Domain, Past, Present & Future discussed geocultures and involved a smaller, more specialised audience who work on bringing together geographical and historical data online. We had learnt our lesson from issues with previous launch periods and had assigned extra resources to the site to cover this period of sustained publicity. However, you cannot predict all possible problem scenarios and we did experience some technical issues. In hindsight we perhaps should have left out the dynamic links to social media which caused most of them. On the plus side the inclusion of a feedback feature and contact details seems to have been a positive move and has led to suggestions on what else people might like to see and offers to participate from more map collections and user testers. We are even considering introducing something similar for A Vision of Britain through Time. Overall we are very pleased with the reaction to the launch of Old Maps Online and how well the message is getting around. This entry was posted in Reviews and tagged A Vision of Britain through Time, Association of American Geographers, historical mapping, JISC, Klokan Technologies GbmH, New York Public Library, Old Maps Online, one day conference, Royal Historical Society, The National Archives. Bookmark the permalink.